Last week I posted about how video is the fastest growing advertisement method on the internet. Also this past week, Douglas Karr posted on Marketing Tech Blog the effects video can have on search results. Karr gives a great example of not only how video can rank highly in search results but the importance of the description of the video as a secondary way to drive customers and prospects to your web site. I decided to do a test of my own with a video I posted on YouTube last November. The video was part of game recap between Peachtree Ridge and Brookwood high schools that accompanied a football story I wrote for the Suwanee Patch. I first logged out of Google so that my profile could not influence the search results. 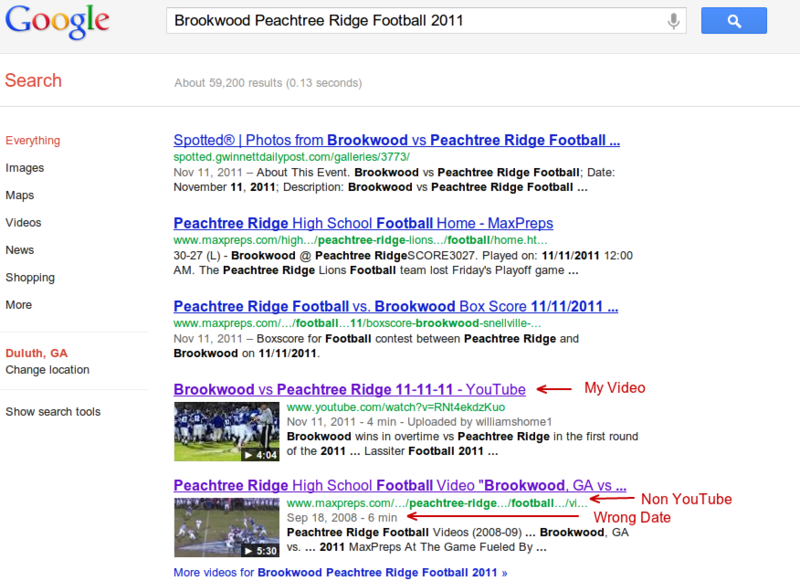 Then I searched “Brookwood Peachtree Ridge Football 2011”. My video appeared as the number four natural search result. The full story I wrote wasn’t even on the first page of search results. That’s significant. The video link is posted on my YouTube channel contains no backlinks (I just created the first one) and I have just a handful of videos on it. Yet it ranked higher in the search results than some media pages including the one I provide content to! Just below my video was a second video from the same game. This content wasn’t sourced from YouTube. It was embedded on the owning sports site. At first I thought it was for a different game between the two schools because the date said 2008. After watching it, I discovered that it was the same game in November 2011, but the owning site posted it to a page for the 2008-2009 sports videos. This emphasizes the point that Douglas Karr made in his post that the surrounding page and content for videos will have impact on the search display and could affect your search results. The lesson for technology marketers in all this is that videos can provide influence for their content but can also provide an added lift to your search results. If you are already using videos as part of your marketing strategy then find out how they rank in relevant keyword searches. If you are not making videos for products and services then now may be the time. YouTube is a convenient host but you can use your own site as long it’s capable of adequately supporting video playback and is setup to allow search engine indexing.